Monday February 27th 1922 Hattie feeling very bad again. She and Cora both in bed. Rob gets his dinner in town, so I manage the rest. I read some when not busy doing for the girls. Two months today I broke my arm. 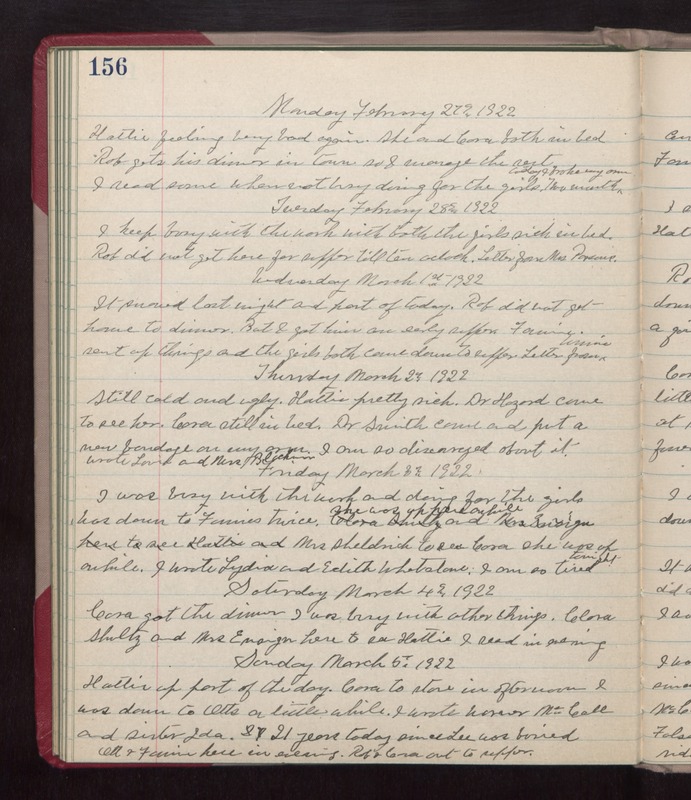 Tuesday February 28th 1922 I keep busy with the work with both the girls sick in bed. Rob did not get here for supper till ten oclock. Letter from Mrs Parsons. Wednesday March 1st 1922 It snowed last night and part of today. Rob did not get home to dinner. But I got him an early supper. Fannie sent up things and the girls both come down to supper. Letter from Winnie. Thursday March 2nd 1922 Still cold and ugly. Hattie pretty sick. Dr Hazard came to see her. Cora still in bed. Dr Smith came and put a new bandage on my arm. I am so dismayed about it. Wrote Lorie and Mrs [Blackman?] Friday March 3rd 1922 I was busy with the work and doing for the girls was down to Fannies twice. She was up here awhile. Mrs Sheldrick to see Cora. She was up awhile. I wrote Lydia and Edith Whetstone. I am so tired tonight. Saturday March 4th 1922 Cora got the dinner. I was busy with other things. Clara Shultz and Mrs Ensign here to see Hattie. I read in evening. Sunday March 5th 1922 Hattie up part of the day. Cora to store in afternoon. I was down to Otts a little while. I wrote Warner McCall and sister Ida. 21 years today since Lee was buried. Ott & Fannie here in evening. Rob & Cora out to supper.